The HOG is a compact, easy to use off road tow behind magnet. Clean large dirt areas easily! 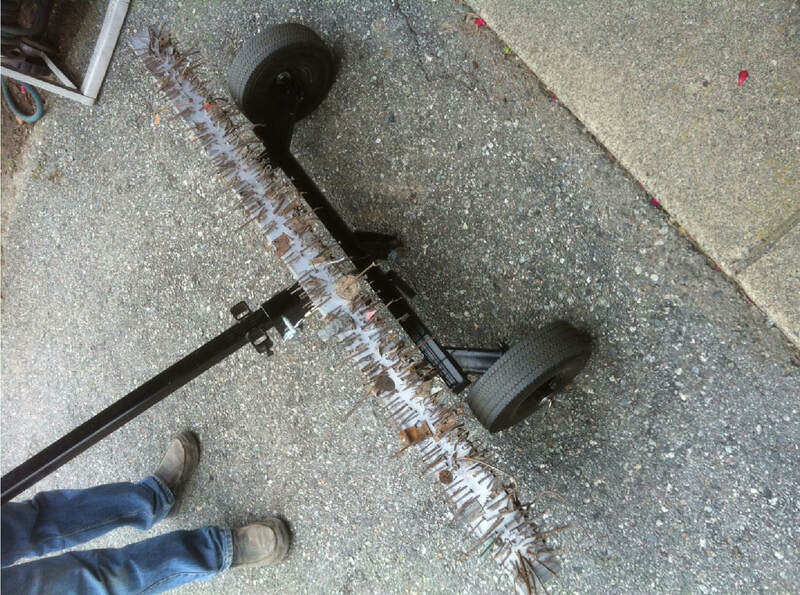 The HOG magnetic sweeper is an all terrain magnet ideal for picking up metal debris from large areas such as parking lots, trucking yards/terminals and farm areas. 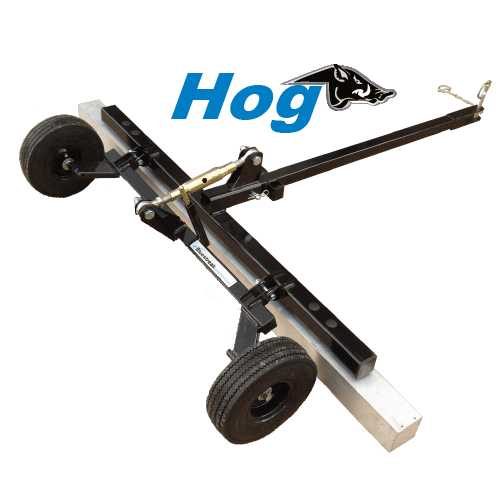 The features of the HOG include adjustable sweeping height from 1″ to 4″, flat proof tires, inset wheels to better accommodate rough terrain and optional Debris Digging Rake Accessory. 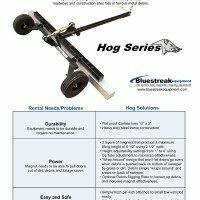 The HOG is a quick and easy method for reducing flat tires and accidents. Easily attach this off road towable sweeper to any vehicle including smaller vehicles such as ATVs and lawn mowers to remove ferrous metal debris quickly and easily. 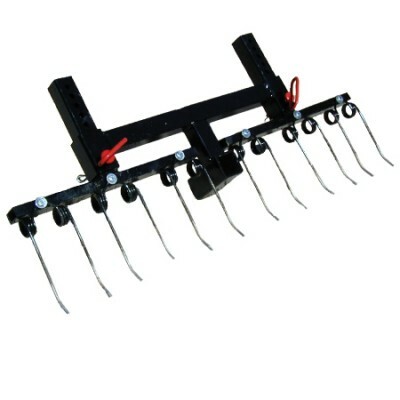 Optional Debris Digging Rake makes picking up metal from gravel and dirt easy. "Nails, bolts, screws, screwdrivers, forming stakes, pins, what ever else you can think of metallic and even long pieces of rebar were no match. The raker bar worked wonders to get deep down and loosen things up. A really nice secondary by product of using the sweeper with the raker bar is it does a great job of leveling the gravel yard as well! 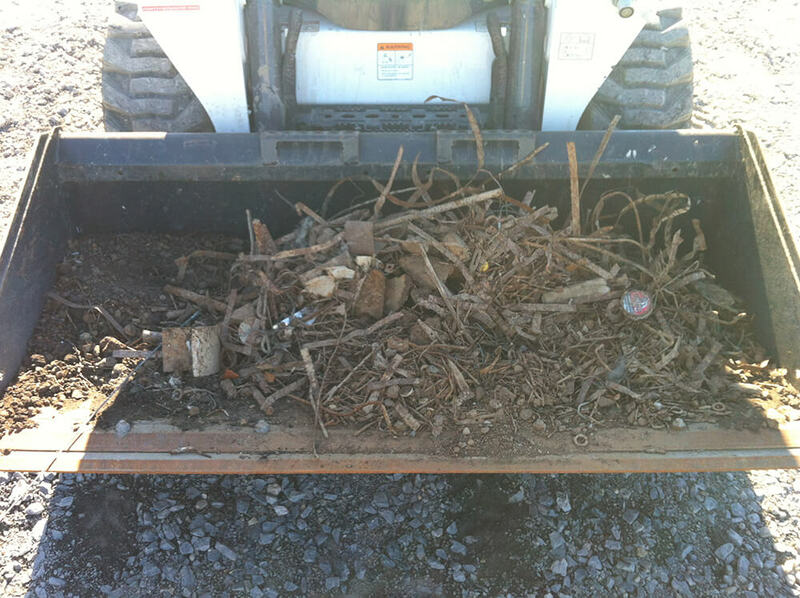 We routinely run it over the lot and we are still amazed at what it pulls out the ground! We are actually renting it out or servicing peoples gravel lots that face the same problem! Seems its opened an possible new stream of revenue!" Kyle’s Lawn & Landscape, LLC. 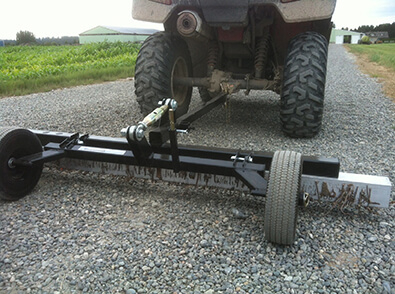 A Tow Behind Magnet Designed for Lighter Applications. The HOG is the little brother of the Rhino. 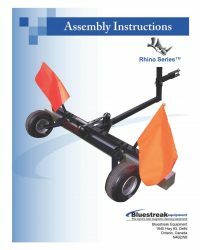 Whereas the Rhino was designed for applications requiring significant pickup power, such as construction sites, horse arenas and small landfills where there is either significant amounts of debris or the debris needs to be pulled up from under dirt, the Hog was designed for the somewhat lighter use applications such as gravel and dirt parking lots, rental center users, trucking terminal yards and farm driveways and yards, etc. 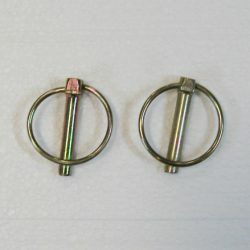 With a 3×3 magnet, the same as the Wrasse 3×3, the Hog’s maximum lifting height using a two and a half inch nail is 6 inches. The sweeping height is continuously adjustable using a turnable top link. Just turn the top link and the wheels pivot up or down to adjust the sweeping height. The flat proof 10 inch x 3 inch wheels ensure no flat problems no matter how bad the debris problem. Easily tow the HOG with an ATV, UTV, lawn mower, golf cart, forklift. The 60 inch width of the HOG is perfect for these tow vehicles because these vehicles are this same general width. The sweeping height of the HOG is continuously adjusted by turning the top link (gold in color in the picture). Just turn the top link and the wheels pivot up or down to adjust the sweeping height from 1″ to 4″. 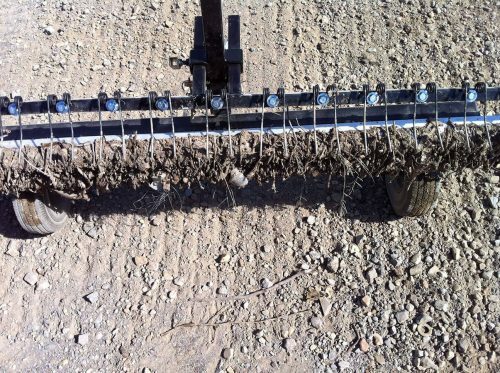 Pick up more debris by using an optional Debris Digging Rake to disturb the ground and loosen metal debris. 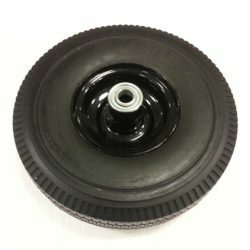 The flat proof 10″ x 3″ wheels ensure no flat problems no matter how bad the debris problem. 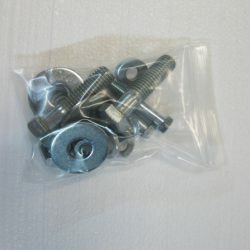 The HOG has the same 3″ × 3″ aluminum magnet housing as the Wrasse 3×3, which makes the maximum lifting height 6 inches (using a two and a half inch nail). The magnets inside the housing are packed end to end un-spaced with a metal backing plate to increase the size of the magnetic field and direct it downwards to increase pickup performance. Easily tows behind ATVs, tractors, lawn mowers or utility vehicles. Available in one 5 foot sweeping width. Pick up more debris by using optional Debris Digging Rake. Magnets packed end to end un-spaced. Maximum lifting height – 6” (using a two and a half inch nail). Hey it did arrive today. Put it together in about two minutes and already tried it out. That thing is amazing! 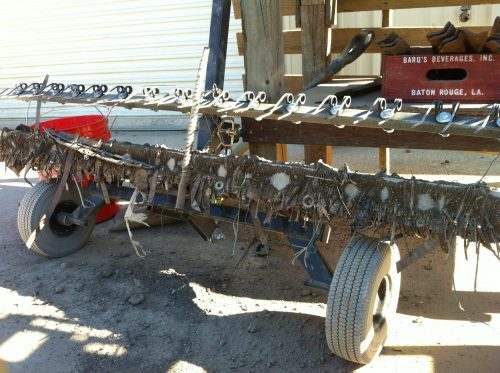 We use it on our gravel road which we have been getting endless flat tires on. You guys have made this purchase so easy for us so thank you. I will attach some pictures. That’s great to hear! And thanks for the photos, it makes it real clear what you’re dealing with there. You have a lot of nails and debris on that road. I have been meaning to email y’all for quite some time with some pictures of your HOG series sweeper at work and the by product of using it. The pictures pretty much speak for themselves. GREAT PRODUCT! We moved into a property that was forming the company’s lot and the lot was a disaster. Bought the HOG series sweeper and went to work. Two passes around the perimeter and the magnet was just about full. Although it took several days of running over the gravel, the magnet pulls an amazing amount of metal out of the gravel. 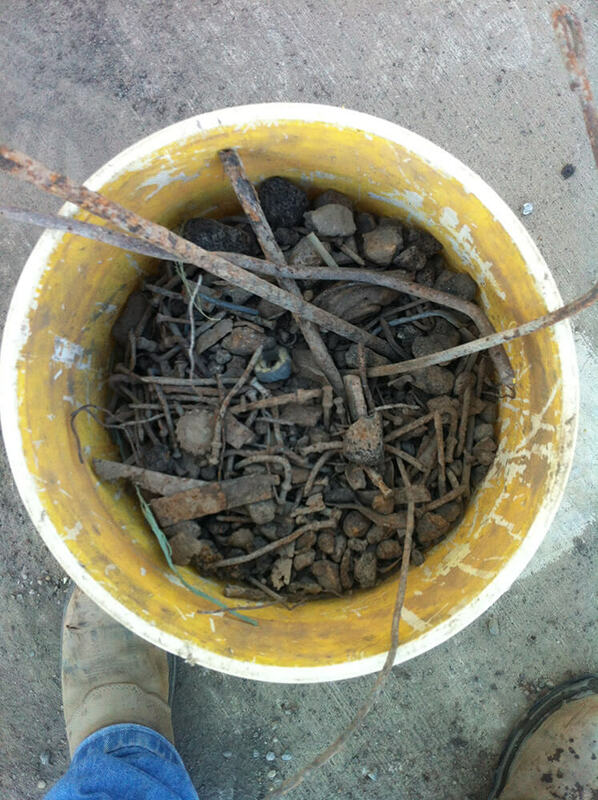 Nails, bolts, screws, screwdrivers, forming stakes, pins, what ever else you can think of metallic and even long pieces of rebar were no match. 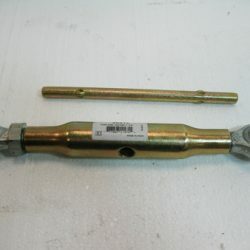 The raker bar worked wonders to get deep down and loosen things up. A really nice secondary by product of using the sweeper with the raker bar is it does a great job of leveling the gravel yard as well! 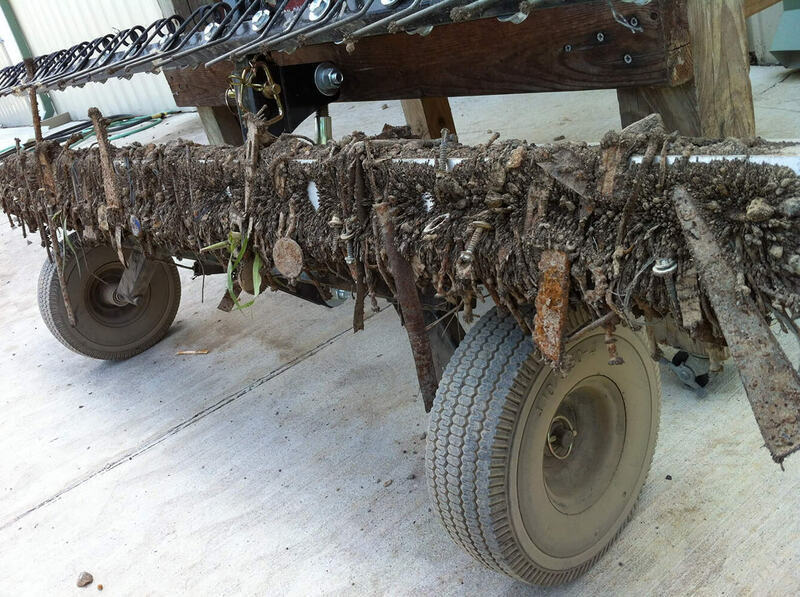 We routinely run it over the lot and we are still amazed at what it pulls out the ground! Only thing I wish it would have come with was the quick clean off sleeve but it wasn’t offered at the time. We are actually renting it out or servicing peoples gravel lots that face the same problem! Seems its opened an possible new stream of revenue! Please find the attached pictures and thank you for keeping all of our trucks, trailers, skidsteers, mowers, and even wheel barrows running flat free from what could have been a very disastrous situation!